Europe’s first civilization arose in Crete and the Aegean islands during the Bronze Age. It is called Minoan after its legendary King Minos. According to the Athenian historian Thucydides, Minos was the first to rule the seas and islands. Thucydides was long thought to be just repeating myths about the king of Cnossus, who reputedly exacted tribune from Athens: 14 girls and boys to be fed to the Minotaur, the bull-headed monstrous offspring of Mino’s wife Queen Pasiphae, and the bull. But since Arthur Evans began excavations at Cnossus in 1900, controversially restoring many of the ruins, Thucydides has been proved partly right, there was a great civilization in Crete with outposts across the Aegean. Cretan civilization started modestly in the 3rd millennium. Around 2000BC the first palaces multi-storied buildings centered on courtyards, were built at Cnossus, Phaestos and Mallia. They were influenced by Egyptian and near eastern models, for the Cretans were by then sailing south and east, bringing home ivory and other luxury products in return for jewelry, wine textiles and olive oil. Egyptian records of the 2nd millennium BC often mention Cretans (as tribute bearers, although Crete was never a tributary to Egypt) but Minoan civilization soon developed its own highly distinctive characteristics. Notable among Minoan society’s characteristics were its peaceful nature and the prominent role seemingly played by women. However, the Cretans were never total pacifists – they presumably relied mostly on their navy for defense and ideas of matriarchy, with women ruling the realm are probably misplaced. Around 1700BC all the palaces were destroyed by earthquakes. Cretans of the period 1700-1500BC (called Late Minoan by Evans, later Palatial by others) produced pottery, jewelry and other vivid artworks can still delight. The palaces, especially the largest at Cnossus, had bathrooms with running water and light wells. Their buildings had dark red columns tapering downwards and rose four or even five stories high. On their walls, frescoes depicted a graceful, idyllic life, with bare-breasted women in long flounced dresses and with elaborate hairstyles, and clean shaven men in kilts, surrounded by flowers, birds and dolphins. A cult of the bull was clearly central to Cretan religion, demonstrated by the many images of bulls and by the bull dance, a game or rite common on murals. The axe was also a common motif. Paved roads connected palaces with outlying villages and villas around the island. The population of Cnossus town reached 30,000 by 1500BC, making it the largest Mediterranean city of the age. 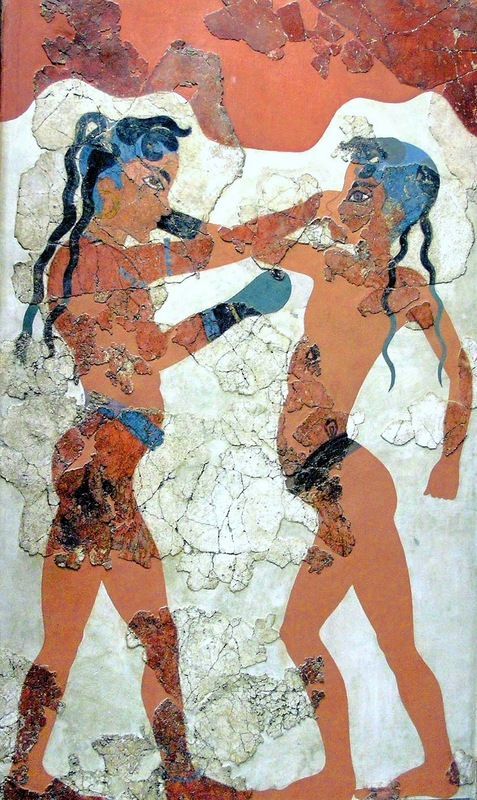 Minoan culture was not confined to Crete, however, but also flourished in the Cyclades and some other Aegean islands. Most prosperous was Thira (Santorini), which was probably independent. Murals excavated there show a fleet attacking a walled townand reveal Thira’s links with north Africa. But the predominant note, as in Crete, was peaceful. After 1600BC, Minoan culture spread to the mainland, with such strong Minoan influence evident in mainland sites that Evans talked of a Minoan Empire. But certainly here the rulers, Mycenaean Greeks, were independent, merely employing Minoan craftsmen to make them precious objects. This cheerful civilization was in its prime when an immense volcanic explosion tore thira apart. It also devastated other islands, including Crete, while preserving part of Thira under lava like a Bronze Age Pompeii. The date of the eruption remains debated, ranging from 1600BC , the geologists preferred date, to 1460BC, which suits Archaeologists better. Indisputably, when Cnossus Palace was rebuilt 1450BC, it was occupied by Greek speakers, for clay Linear B tablets written in early Greek have been found there. Although a warlike note emerges in the tablets, Cnossus, house of the double axe, remained unwalled. Then one day 1380BC a fire, caused by accident, earthquake or human attack, gutted the palace once more and it was never rebuilt. Minoan culture now entered its less glorious post palatial phase. This may not have been totally impoverished , Homer ranked Crete as second only to Mycenae in his Catalog of ships . But 1100BC Dorian Greek invaders, who had attacked the peloponnese already, invaded Crete, finally wrecking the Minoan world.